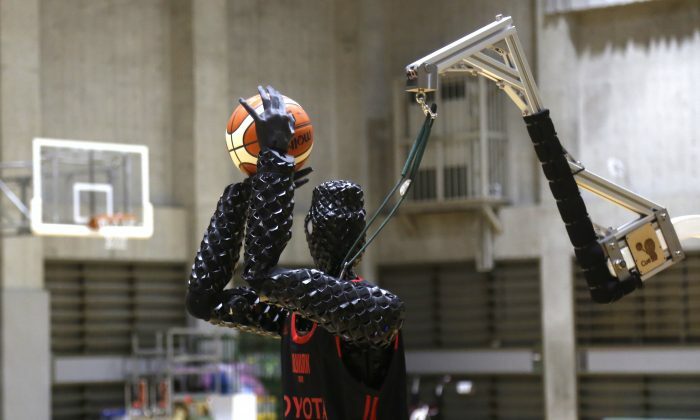 TOKYO—It can’t dribble, let alone slam dunk, but Toyota’s basketball robot hardly ever misses a free throw or a 3-pointer. The 207-centimeter (six-foot, 10-inch)-tall machine made five of eight 3-point shots in a demonstration in a Tokyo suburb April 1, a ratio its engineers say is worse than usual. Right after missing, the robot slumped over. It wasn’t a disappointment, but a temporary power failure. The maker of the Camry sedan, Prius hybrid, and Lexus luxury models has shown off various robots, including one that played violin. Another, resembling R2-D2 of Star Wars, slides around and picks up things. At the April 1 demonstration, it handed the basketball to Cue 3. Toyota’s rival Honda Motor Co. has its Asimo, a culmination of research into creating a walking robot that started in the 1980s. It not only can run but also recognize faces, avoid obstacles, shake hands, pour a drink and carry a tray. Will Robots Make Americans Unemployable?